Parade of the Species Bollard, Detail, 1998. �Four �bollards in a row, �Adobe Corporation’s campus at Lake Union, Seattle, WA. 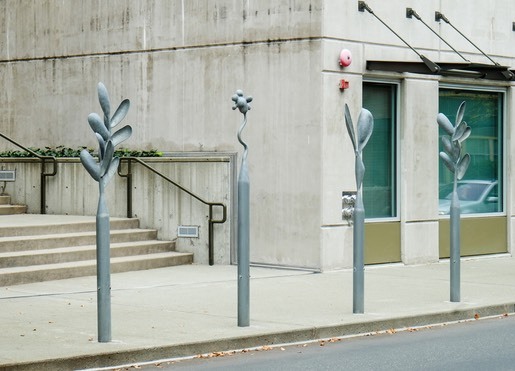 �There are ten bollards in the series, each approximately 84”high x 15”wide, forged steel with a flame -sprayed zinc finish.� Commissioned by Adobe and Quadrant Corporations, Lake Union Center, Seattle, WA.